Mammoth gravity battles is a turn based strategy/artillery game with high quality 3d graphics and featuring 2D and 3D levels, multiple weapons, four player battles and a story driven campaign. Similar to death star battles/gravity wars you aim the shots from your mammoth ships and watch as they fly in all three dimensions pulled by the gravity of the stars, planets, asteroids, moons and black holes in each sector. Will be released very soon on Android and afterwards on iPhone, iPad, Blackberry, Windows Phone 8, Windows PC, Windows 8 RT, Ouya, Mac and Linux. 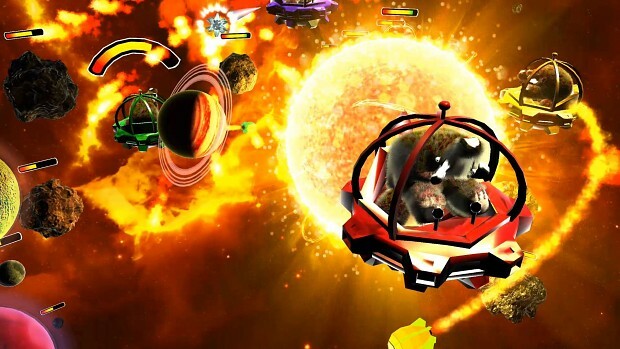 Mammoth Gravity Battles takes a fusion of artillery and turn based strategy to the extreme as projectiles trace chaotic winding paths through the real physics of space-time warped by the gravity of stars, planets, block holes and wormholes. Aiming in a simulated 3D gravitation field is NASA rocket scientist complex, something players will never have experienced before. Fortunately a robust single player campaign introduces the game elements one at a time. The players start learning about 2D gravity fields with all elements confined to a plane (same beautiful 3D graphics) before teaching them the chaotic wonder of the full 3D gameplay. At the end of the campaign players are ready to destroy friends in four player battles using all of the 16 different weapons. Battlegrounds are procedurally generated and a range of AI levels mean the game can be played again and again; each time a new emergent experience. Nothing beats the surprise when a shot orbits a star and hits you in the back or when you pull of a tricky shot through a wormhole. Mammoth gravity battles has just been released to on Google Play store and will be available later this year on iOS, PC, Mac, Linux.